Late summer and early fall is such a great time of the year! The farmers markets are just jam packed with tons of good things and some of the ones that I like the most are the perfectly ripe field tomatoes and the red peppers. One of my favorite ways to enjoy the tomatoes is to roast them and use them in various things like pasta sauces. My favorite way to enjoy red peppers is also to roast them as it bring out their amazing flavour and I tend to go through a lot of them. In fact I commonly get a bunch of both the tomatoes and the red peppers that I roast and then freeze them for the use throughout the winter. Not to completely jump topics here but bear with me; I also really enjoy creamy gorgonzola sauces. You can see where this is going now right? I recently came across the brilliant idea of combing them all into one amazing sounding roasted tomato and red pepper sauce with blue cheese on Kayotic Kitchen and I just had to try it. Well the original recipe called for magor which is a combination of mascarpone cheese and gorgonzola but I was unable to find the magor so I just used equal parts of both the mascarpone and the gorgonzola. The first thing that always comes to mind when trying out new sauces it to use them in a simple pasta where they are the star of the show. 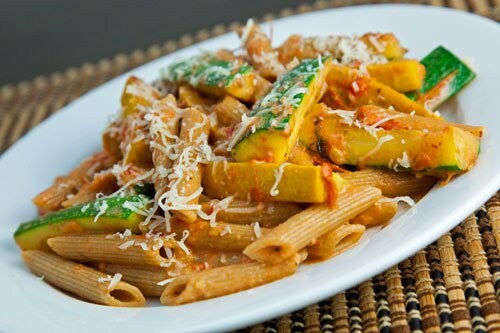 It seems that I always have some extra zucchini on hand these days so I decided to add some to the pasta to fill it out a bit. The roasted tomato and red pepper gorgonzola sauce so good!! It was just packed full of the flavours of the roasted tomatoes and red peppers and the cheeses made the sauce so nice and creamy. The gorgonzola really worked well in the sauce adding a really nice undertone of the tangy cheese without overpowering the rest of the flavours. What a great way to enjoy the bounty of these dwindling days of summer! Toss the tomatoes, garlic and onion in the oil, oregano, salt and pepper to coat. Spread the veggies out in a single layer in a baking dish. Bake in a preheated 400F/200C over until nice and roasted, about 45-60 minutes. Squeeze the garlic from there skins and puree everything. Mix in the cheese and heat on the stove until the cheese has melted into the sauce. Gorgonzola is such a flavorful cheese! A great dish! Oh yes, roasting the tomatoes DEFINITELY brings out the best flavor in pasta sauces – yum!! all i can say is "oooooooooh yum." You can't go wrong with roasting tomatoes & red peppers, but the addition of gorgonzola makes this sauce over-the-top amazing! Yum!!! I love roasted tomatoes. Love blend of flavors you got going on in that sauce. Yum!!!! I love gorgonzola sauce but I have paired it with roasted tomatoes. It sounds delicious. Great recipe as always! Looks so tempting…Kevin, how do you manage to come up with somethign so heavenly every single day ? Love your blog – its inspirational ! I'd like to use more gorgonzola. This recipe sounds great. Roasted tomatoes… cheese… what's not to like? Another great recipe from you, as usual. I was so glad I came up with this sauce. It's slowly turning into my fav pasta sauce. Try it with pomodori tomatoes next time! It's even more heavenly that way! Plus my grill has a very large surface area so I can do large batches at once. It really works well! WOW! I could use a plate of this right now.. I love that its all pureed together. This looks so fantastic Kevin! WOW, that looks incredible, and I will definitely put this one on the menu this week, since I've got a bushel of romas for roasting and canning sitting on the counter. Oh this sounds more than fantastic! I adore gorgonzola in pastas and it is SO good with roasted tomatoes. This is ideal. I think it's the most delicious sauce for pasta that I have ever seen. I'm sure cooking this soon. gorgeous! i can practically taste it now! It would be cool for you to open a cafe! Oh yummy, this looks absolutely delicious with those roasted veggies! Amazing! I have started to add roasted red peppers to my tomato sauces and I love the richness and smokiness they add. I have been dying to roast tomatoes too, to make a sauce but haven't yet. I'll bet together the roasted tomatoes and peppers are fabulous. But add gorgonzola to it? OMG must be fantastic! Wow! I LOVE gorgonzola and any variation – the idea of it in a sauce is fabulous! You have put together a must try for us. This looks spectacular with the gorgonzola, one of our faves. You come up with some great dishes, Kevin. Love the combination of blue cheese and mascarpone. Another perfect meal! Oh I know I'd love this … gorgonzola AND mascarpone AND roasted red pepper?! The perfect pasta sauce if you ask me! This is one of the best sauces I have ever made. Thanks for this great recipe that is full of flavor!